Chickens are the perfect small homestead animal. In fact, they are ideal for the backyard farmer, even those in urban areas. They provide eggs, meat and rich fertilizer for the garden. Choosing the best backyard chickens for your farm, large or small, is important. The breeds that make the best backyard chickens for kids are also usually the best backyard chickens for beginners. These breeds are docile, curious and friendly. Speckled Sussex – This heavy English breed is exceptionally pretty. They are even friendlier than they are striking. The hens are good layers and the produce a lot of meat, making them a good dual-purpose breed. Ameracauna – Also called “Easter Eggers”, these hens lay beautiful blue, green and lavender eggs. Your kids will love going to the hen house when each morning feels like Easter! Buff Orpington – Even Orpington roosters are friendly. The only reason they may not be the best backyard chickens for your farm is because they get broody. This is great if you want to raise chicks, but can be frustrating if you are only raising chickens for eggs. Looking for the best laying chickens to raise? While all hens lay eggs, these breeds make the very best backyard chickens for those of you who can’t wait to have farm fresh eggs on the table every morning. Goldline – Don’t let her small size fool you. A little Goldline hen will lay up to 320 large brown eggs every year, making this one of the best chicken breeds for eggs. They are true laying machines, and they’re friendly too. Black Australorp – This breed holds the record for the highest number of eggs laid in a single year – 365, making them some of the best laying hens for backyard poultry keepers. They are social and easy-going members of the flock, though they can be a bit noisier than other chickens. Golden Comet – Many people claim that these buff colored hens are the best backyard chickens for eggs. They can start producing large brown eggs at only 18 weeks of age. Best of all, the males and females are different colors, so you can tell them apart easily at a young age. Rhode Island Red – These hens will lay in the winter months when your other girls are taking some time off. You can expect over 250 large brown eggs per year out of a Rhode Island Red if you treat her well. 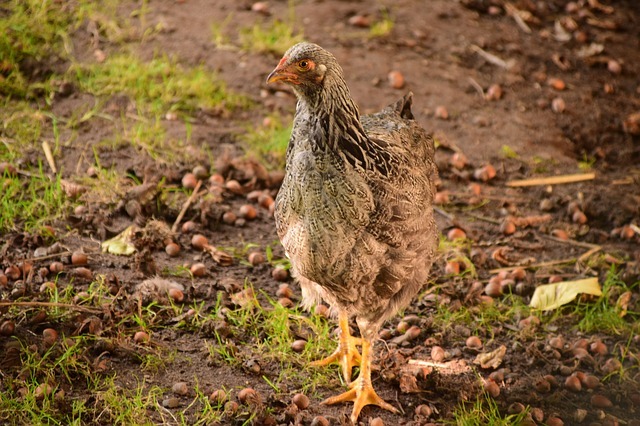 Plymouth Rock – Everyone has their own opinion on which are the best backyard chickens, but no flock is complete without a Plymouth Rock. These grey speckled hens lay 200-250 eggs per year. They are winter hardy and great foragers. Studies show that the average hen lays the most eggs in her first laying season. After that she’ll lay about 80% the next year (though her eggs may get larger), 70% the year after and about 10% fewer eggs every year thereafter. However, heritage breeds often have a longer productive life. They will lay nearly as well as other breeds, but can keep laying at a high level for up to six years. If you are interested in raising one of the heritage breeds that make the best backyard chickens try a Maran, Goldline, Dorking, Single Comb Brown Leghorn or the Black Minorca. Check out www.thechickentractor.com.au for essential chicken keeping needs. Still looking for the best backyard chickens for your little farm? Take a look at these beautiful heritage chicken breeds and be inspired.